New features for the European-spec i-MiEV include electronic stability control and a different front and rear bumper design. 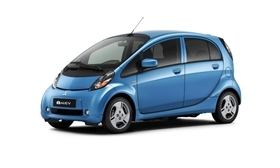 Mitsubishi Motors Corp. will begin European sales of its new-generation i-MiEV, the company said in a statement. Mitsubishi began production of the European model last October and about 200 units of the minicar have now been shipped to dealers in 15 countries around Europe, the automaker told Automotive News Europe. The basic model will cost 29,970 euros ($40,172), after local incentives, in France. "In other countries where no such incentives exist, we target a range of 33,000 euros to 35,000 euros depending on tax system and market situation in each country," the automaker said. Mitsubishi expect to extend the model to other markets, including Finland, Serbia, Turkey and Slovenia in the near future. The automaker also produces the Peugeot iOn and Citroen C-Zero EVs for French carmaker PSA/Peugeot-Citroen SA. Mitsubishi currently produces all three models at its factory in Mizushima, Japan. The Japan-spec i-MiEV has been on sale since 2009. Mitsubishi said new features it added to the i-MiEV for the European market include electronic stability control and a different front and rear bumper design, as well as a re-arranged center stack for an improved interior feel. According to the carmaker, the i-MiEV can be driven for 150km (about 93 miles) on a single electric charge.